High Visibility Vests – 24 X Hi Vis vests, sizes ranging from S-2XL. Ideal for helping to meet OH & S obligations when undertaking conservation works. Data Projector – available for running PowerPoint presentations or videos from a laptop. PC connector cords available. Includes DVI adaptor for Mac computers. Projector Screen – available for data projection. 174cm x 135cm portable screen. Video Camera – portable handheld video camera. Suitable for making videos and taking photos. BBQ – Footy Master BBQ and gas. Great for events or field days. 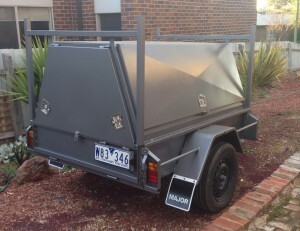 Trailer – Trailer with lockable cover (see photo) available for use. Includes trailer lock and rear opening door. Contains BBQ inside unless requested to be removed. For more information on making use of this equipment, please contact our Landcare Facilitator. All equipment is lent by the Network under a hire agreement.